Thread: Stencil + Pounce worthwhile? I am nearly done piecing my second quilt together. 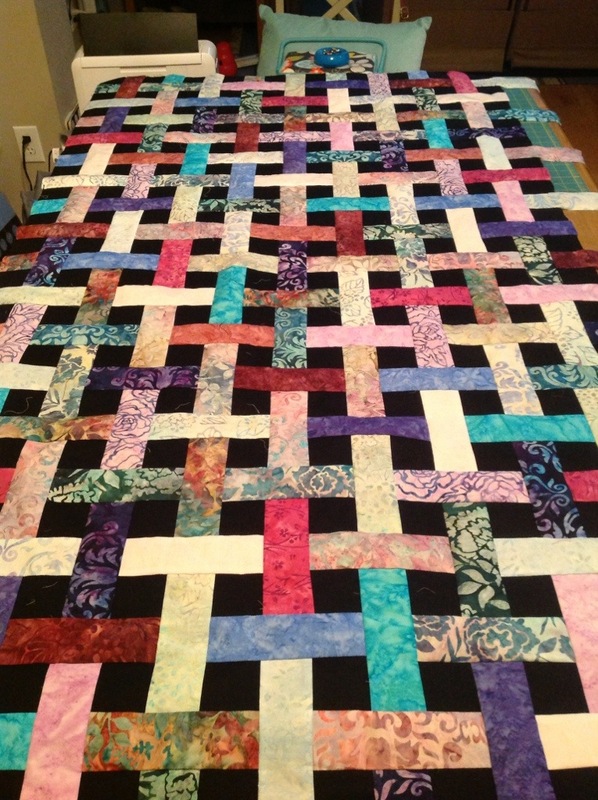 My first quilt was a baby quilt with appliqué blocks, which I did stitch in the ditch with. This quilt is a basket weave lattice lap quilt, and I am contemplating trying a meandering stipple stitch to quilt it. I of course will make some little practice sandwiches first, and if I am terrible at it I will just go back to stitch in the ditch until I get good enough at FMQ to try it on a real quilt. i am wondering if a stencil and pounce are worth buying, or if I should just go for it without a guide. What do you guys suggest? I'd go without a guide, but practice on something else first, welcome to the board. Absolutly beautiful! I have been just practicing FMQ myself for a quilt I'm working on. So we are at about the same place. Try FMQ and see how you do with a meander. I had a real hard time and thought I'll never get this. (I have a Bernina 440QE with BSR.). I haven't gotten good enough for this quilt. I asked questions on QB and most replies were "practice, practice, practice" and "It's worth it!". From what I've done I'd recommend no to the pounce and stencil. I'm hoping you catch right on to it. Good luck! I agree with Reb. I have tried pounce and stencil...I would also say no. meandering would look nice and so much easier to do. I think there's a time and a place for a stencil and pounce. However, for this quilt the stencil design, let the fabrics "strut their stuff"!!! A simple meander or a loopy-de-loop would work fine. And yes ... practice! practice!! practice!!! No answer for your question, just want to say that you have a beautiful quilt. Me, too. I'm wondering where you got this pattern..... love it. I'd rather spend money on my quilting hobby than the therapist.... I'm probably $$$ ahead.... and I'm happy!! I have been longarm quilting for nine years, one of my go to tools is a stencil and pounce. So many patterns available and grids. Look into Pam Clark's stencils for a million different options. Go for it and have fun! I did not like the stencil and pounce method at all. for me, it was messy, even with patting the chalk on, and, it rubbed off when I tried to rearrange the quilt. I do use a pounce. I don't like all-over quilting, so I will FMQ old pattern on plain squares. I mix straight, SITD, and FMQ as I think the quilt calls for. I need a tool that will perforate computer paper. I prefer to do the simple border shapes on the computer and resize as necessary. It's a major pain to use the point of a seam ripper to perforate the paper. The Dritz pattern tracer almost does it, but not quite. I love the pounce chalk and stencils. I apply the chalk with a small foam paintbrush rather than pounce it. This way I just get in the cutouts of the stencil and less of a mess. I found the pattern at a local shop, but have seen it online too. I am pasting a link below to the site for the pattern, you can search around for it. The pattern is full color and nicely done. This quilt requires a lot of cutting and piecing. If I do it again I may just buy some precut mini charms instead of cutting all those black squares. If you do make it and cut your own, I highly recommend a Shape Cut slotted ruler... I picked a couple of them up part way through the cutting and it made life so much easier. I have a small Shape Cut and the large Shape Cut Pro. The Pro is a must have in my opinion! Gorgeous quilt top!! I can see why you want to do a meander. Meander to me is a non quilt pattern. It quilts the quilt but doesn't distract from the pattern. I really can't think of a design that would work on your woven design without impacting the design except SITD and I wouldn't want to attempt that. How are you at a large meander? I tend to have trouble keeping my spacing consistent over a whole quilt. There are meander patterns that are in a block format that you can work across the quilt. Is this what you were thinking of using? If so I don't think a pounce would be very visible over the variety of fabrics in your top. I might find a meander block that would work and make a paper master block pattern. I would then use some method to stitch the design through a pattern. I would either make tissue paper tear aways or use Golden Thread paper. Do you intend to wash your quilt when you finish quilting? I have been thinking of using the idea I saw this month on marking with ordinary white chalkboard chalk. You use a makeup pencil to sharpen it to a nice point and mark your design on the quilt top. It said to erase it with a micro fiber cloth but I tried a sample and I could still see the line. I am going to try this method on my next quilt but wash it afterwards to remove the remaining chalk lines. Sorry this is so long but I wouldn't want to mess that beautiful top up either! Yes a stencil and pounce will help. The reason is that it will keep your design consistent in size. I have found that most beginner fmq students either are too large or too small in size of the motif. Practice does NOT make perfect unless you have discovered a good technique. There are meandering stencils available in a number of sizes. I recommend the miracle chalk powder as it will stay on the quilt longer. There is some really good info here, I agree marking it would probably make it easier. Your quilt is beautiful!!!!!!!!!!!!!!!! I like to use a stencil - but instead of a pounce pad and chalk - just put the chalk into a container and use a small foam brush to apply the chalk to the quilt top. you can put/paint the chalk right on the lines of the stencil - instead of all over the top of the stencil. It is no where as messy and you don't end up with chalk all over the place. Plus when you are quilting the extra chalk tends to "bounce" all over the top. Try the chalk and a foam brush... I like it!!! Thanks for all the suggestions! Opinions seem mixed, so I think I will try a variety and see what works best for me. I will start without a stencil and see how it goes... I will have to order one anyway since I haven't seen one locally yet. I will try it freehand, with paper, and with stencil/chalk... and I will give the foam brush trick a shot too. Luckily one of the ladies at a local shop gave me some scrap batting so I can start with that, and some clearanced fabric I picked up for practicing. How are you at a large meander? Don't know, never tried it! This will be my first attempt. There are meander patterns that are in a block format that you can work across the quilt. Is this what you were thinking of using? ... find a meander block that would work and make a paper master block pattern. I would then use some method to stitch the design through a pattern. I would either make tissue paper tear aways or use Golden Thread paper. Yes, I am sure it will be hard to stay consistent, especially since I am new at this. I will definitely try out this paper method, it sounds like it might be good for me. Yes I think I will. This is only my second quilt, so I am still learning and experimenting. I want to know what happens when I wash one... plus if I use this quilt I am going to have to wash it anyway because my dogs see using a lap blanket/quilt as an open invitation for lap time. I will definitely use a color catcher with it, since there is a wide range of colors. I will keep this method of marking in mind as well! I've never used my pounce. However, that quilt is gorgeous!! I am no help but I love your quilt! It is beautiful!!!! This is a great tip!! One of these days I will give it another shot. Hmm...maybe on the childs quilt I just made. When you ae using pounce are you using a long arm or a sewing machine. I find its so messy and rubs off. I LOVE this quilt! It's very dramatic and looks like a basket weave which is really cool! The black background really makes it pop! Stunning! Your quilt is just gorgeous. I'd love to see the finished product after you have done your quilting.